Kona coffee, from the eastern coast of the Big Island of Hawaii, is one of the most prized coffees in the world and demans a high price tag. The region’s rich, volcanic soil, shaded hillsides and lovely weather produce consistently excellent coffee with a distinctly smooth flavor profile. 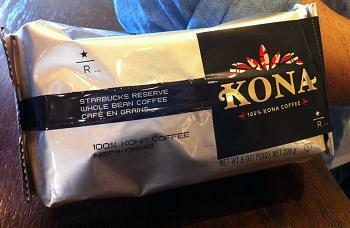 Unless you’re in Hawaii, it’s not common to see Kona on coffee shop menu boards and it was definitely exciting to see 100% Kona Coffee enter the Starbucks Reserve lineup this month. I jumped at the chance to have a cup from the Clover machine at my local store when they started stocking it. The coffee is dark and very smooth, with an almost velvety finish. It is fruity and sweet, with a floral hibiscus note to it and a smooth, citrusy aroma. It’s billed as a medium bodied coffee but seems darker, although it doesn’t quite have the earthiness of some dark roast coffees. It’s smooth enjoy that just about anyone would enjoy drinking it. I’ve seen this sold at several other Starbucks in my area, even those that don’t have Clover machines (unlike some of the other reserve coffees), so it is one that you might want to keep an eye out for and bring home to brew. It goes without saying that it’s well worth indulging in a cup if you’re at a store with a Clover, too.